I'm a newbie and I got into it mainly through osmosis (literally?) from my better half. I have been hunting for this particular fragrance "Caron pour un homme" and I could not find it anywhere, not even the self-proclaimed "complete" perfume outlet at Sephora. Anyone can help? Ever the smalltimer, I have only two: L'eau D'Issey Intense (immediate appeal) and the more complex YSL Kouros. Shanecross, I smelled that in Taipei recently. It was at a shop called Cyrano in the Bellavita mall. I am told that you can try your luck at those deadstock perfume places like 'Jasina' in Singapore. No places in KL, unfortunately. kotmj, try Escentials at Isetan KLCC after they finish renovating. Or Penhaligon's or Escentials the next time you're in Singapore. Ahh..i see..how much do they cost in SG? Im assuming around that 70-80SGD range? Just curious, did you like how it smelt? 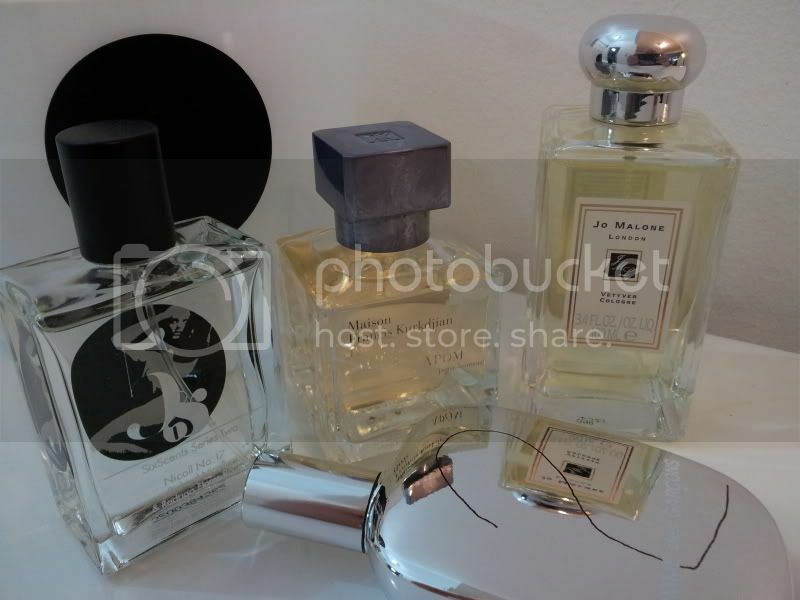 I'm using creed silver mountain water, bvlgari man, escada n cpl hugo boss. Looking for Penhailagon english fern next. I found that some of perfumes in KL is cheaper than Singapore ie creed i bought in sg was actually cheaper in KL at Isetan KLCC but marginally. I was in Manila i was introduced to Maison Francis Kurkdijan and Floris. Francis Kurdijan was really nice but crazy expensive, Floris was just slightly cheaper. I cant see myself paying that much for a perfume. Shanecross why dont u try this website. I saw your parfums caron on there. They've got brands i've never heard of and cost an arm and a leg. Managed to order this for RM150. I like Caron Tabac Blond. On a sidenote, has anyone tried the hammam at bangsar village? One of the foundations of modern fragrance notes. Found this quite a while back but never managed to buy anything from them. But the prices were extremely reasonable. The Vetiver Extraordinaire and Midnight in Pairs have been absolute winners with women so far. The Geranium Pour Monsieur's top note is usually a little bit unusual for women but the middle and base notes smell much better to the ones I've tested it on. If you go for a vetiver fragrance, definitely give the Vetiver Extraordinaire a whiff! I just moved back from London and have only gotten into fragrances recently. While I was there I spent some time walking around visiting the British scent brands retail outlets - Penhaligon's, Floris, and Jo Malone but found them rather weaker (mostly EDTs instead of EDPs) and less developed relative to the French and Italian fragrance houses, but that's just my untrained nose speaking so do share your opinions! sorry the above post was me. Glad you included this section in your review. The ultimate litmus test for scents is the effect they have on the women in your life (not including grandma, mom, pet goat). I'll definitely give the Malle Vetiver a whiff if I'm ever in Singapore. While you're there you might want to try Guerlain's Vetiver as well. It's the more classic vetiver scent, much more available (and also much more affordable) while the Vetiver Extraordinaire has a slight edge to it. Changi stocks the Guerlain's Vetiver which retails for about SGD 105 for a 100ml EDT. Just purchased a bottle recently on one of my weekly layovers there. Actually I'm still trying to find places to get fragrances in Malaysia. It's a daunting task after being used to frequenting what was voted the best perfumery in the world 2012 by Basenotes readers. Any recommendations? Heard BSC might have some good spots? i kinda like the freshman by truehill and fit.